I have been an Anglophile since the Royal Wedding. Not Kate and William - the other one. So when Scott and I first visited London together a few years back, he was very patient as I slowly strolled through an exhibit of Diana's dresses at Kensington Palace. London is calling me again this year, with this new exhibition of Diana's dresses that marks the 20th anniversary of her August 1997 death. However, since we just visited London again last fall, and will be nowhere in the neighborhood of Kensington Palace this summer, I am enjoying scrolling through photos from the exhibition from the Daily Mail, and on the Palace web site. In middle school, I thought so many of these dresses were quite stylish. I suppose they were at the time, but in hindsight, some of the early ones (like that billowing wedding dress) aren't really my cup of tea. A few - like the shift dress above left or the one below in which she famously danced with John Travolta at the White House - are a little more timeless than some of the other frothy frocks. You can check out most of the dresses on display here. What are your favorites? * Photos from The Daily Mail. During our visit to London last fall, we downloaded a Rick Steves podcast walking tour that explored the nooks and crannies of The City - the old square mile that houses many of the London's oldest and most historic sites. 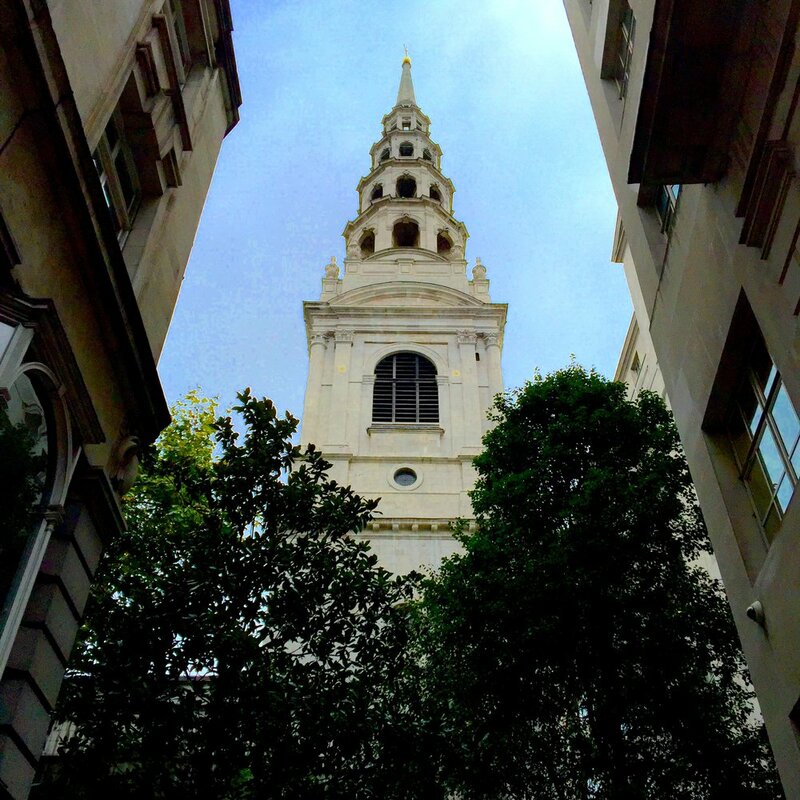 While I loved seeing well-known sites like St. Paul's Cathedral, one of my favorite spots was St. Bride's church - a beautiful Christopher Wren church with a "wedding cake" steeple that is hidden in a courtyard off of Fleet Street. Known as "The Journalists' Church" - because of its proximity to Fleet Street, which for decades was the home of British tabloids and other media - the church offers a spiritual home to those who inform us, sometimes risking their lives to do so. Such a refreshing thing- especially at a time when journalists are under attack - both literally and figuratively - from so many directions. 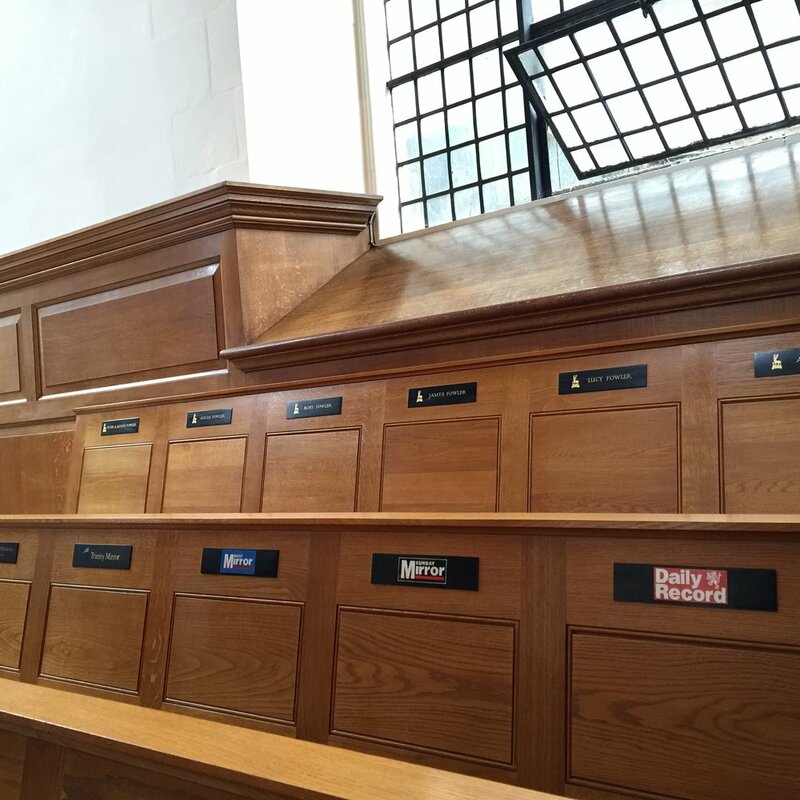 Most pews and seats are sponsored by news outlets and journalists - or are memorials to those who lost their lives in the line of duty. Memorials and plaques like this throughout the church are somber reminders of the dangers journalists to face every day throughout the world. A pianist was rehearsing for a lunch hour concert during our visit. I look forward to going back and attending a worship service next time we are in London. What are some of your favorite "hidden" spots you have discovered in your travels? Now that holidays are "officially" upon us, I am totally immersed in holiday reading. On our recent visit to London, we found ourselves fascinated by the ceramic "Blue Plaques" that adorn houses where famous (and infamous) people lived. The New York Times recently had an article discussing the history of these plaques. As one who is obsessed with "A Christmas Carol" in all forms, what better way to celebrate the holiday season than a stop by Dickens' house? Last week, I was getting ready to make pumpkin bread - with all of the ingredients staged around the kitchen counter - when this recipe for Soft Pumpkin Cookies popped up on Lovely Little Kitchen's Instagram. Decisions, decisions. I made the pumpkin bread - essential to our Thanksgiving dinner - but these are on next weekend's agenda. Can't wait to see the new permanent installation on NYC history "New York at Its Core" at the Museum of the City of New York. This museum is only about a 15-minute walk from our apartment, but we don't get there nearly as often as I would like. If you still have leftover stuffing. Brussels sprouts, cranberry sauce, turkey gravy and more, layer them up into The Kitchn's recipe for Leftover Thanksgiving Lasagna. Our leftovers consist mostly of turkey and cranberry sauce (mmm...sandwiches), but if you try this, let me know what you think. I am so addicted to Apartment Therapy's House Tours. I can't pull up the site without spending at least half an hour scrolling through, especially any and all apartments and flats in New York, London and Paris. Finally, this weekend, the New York Times published their list of the 100 most notable books of 2016. How many have you read? Have a lovely - and festive - week! In our travels, Scott and I love visiting cathedrals and churches. Of course, we go to the famous ones, but also enjoy popping in to small, tucked-away ones such as London's St. Bride's Church ("The Journalists' Church"). Even better if we can go to a service. 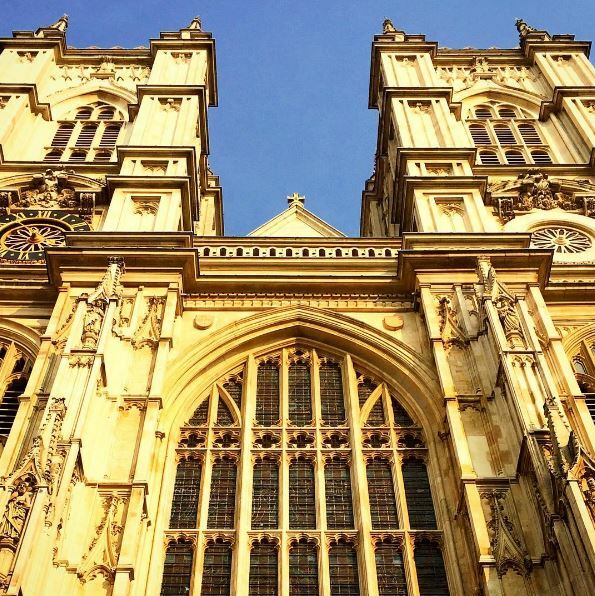 Since we had toured Westminster Abbey on a previous vacation in London, we decided to attend one of their Evensong services during our recent visit. You can't wander around the church - it is a worship service, after all - but you will get beautiful views of the church on the way to your seat and during the service. Much of the service was sung by the Choir of Westminster Abbey (amazing! ), with prayers and scripture readings interspersed throughout. We went to a 5 p.m. service, but check the Abbey's web site for the schedule of services on the date you want to attend. No tickets needed and, unlike touring the cathedral, there is no entrance fee. Just join the queue outside the entrance about half an hour before the service time. We also had great seats for the service. Scott was not impressed by this, but we sat precisely where Kate Middleton's family sat during the 2011 Royal Wedding. No Royals to be seen at this service, but the seats provided a beautiful view of the church. After our week in Paris, we hopped on the Eurostar train to chunnel over to London. (Easier, cheaper, faster and a whole lot more relaxing than dealing with airports). We are excited about returning to some favorite spots, discovering new places, and spending time with friends at my alma mater's study abroad program. 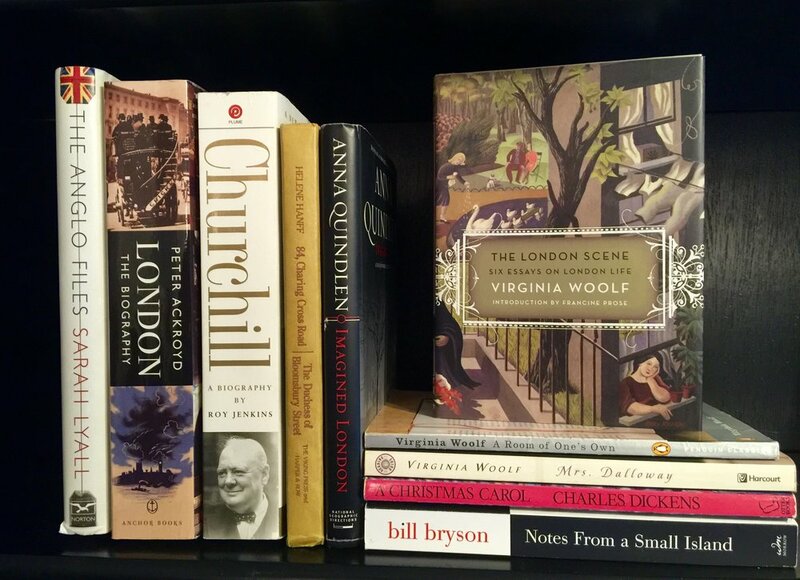 In addition to reading books about Paris and watching movies set in the City of Light, I also browsed a few of my favorite London books before we left. Several of these are quite worn, and book lovers will understand when I say a few are like old friends. I have been an Anglophile since the Royal Wedding (not Kate and William. The previous one), so a few of these have been on my shelf for awhile. This best-seller by a longtime London-based correspondent for the New York Times humorously explores what she refers to as the eccentricities of the British people - including her own husband. Same theme as above. Could not stop laughing. A more academic version of the first two books - and just as entertaining. Subtitled "A Tour of the World's Greatest Fictional City," this and the next few books should help restore my Anglophile credentials. You probably know Quindlen from her best-selling novels, but her enchanting story of visiting England for the first time will draw you in from page one. Many of us form our vision of England through the prism of English literature (which in my case, was supplemented by reading about the Royal Family). I first visited London while doing study abroad in college, and completely relate to Quindlen's search for the city she had read about all of her life. This classic about post-war correspondence between a Manhattan writer and a London bookseller also inspired a movie. If you like reading books about books, you will love it. Again - the story of a writer finally realizing her dream of visiting London. (Did Jane Austen write a book about visiting London for the first time? If so - count me in). Great writers make you feel you are right there, in the midst of the story instead of reading it on a page. This short collection of essays about London life, originally written for the British edition of Good Housekeeping, will do just that. Vivid portrayals of post-World War One London. Widely viewed as the definitive book about London, this is much more scholarly than the others. It looks nice on the bookshelf, but I confess I have never actually finished it. I just peruse various chapters from time to time and aspire to actually finish it one day. Chime in and tell me what else I should read - and feel free to set me straight about Jane Austen.